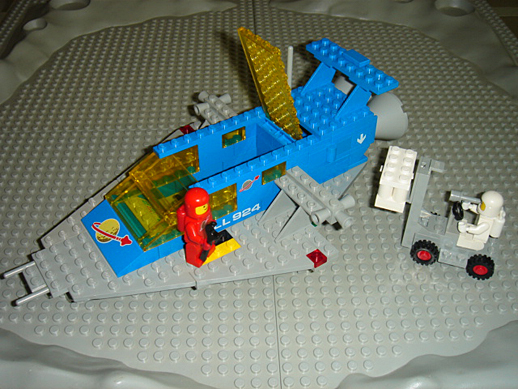 When I was 5, I was given my first set of “Space Lego”. Now, in this day and age, nobody would blink an eye hearing that. Whatever. There were a million sets of Space Lego, they’d say. I suspect my kids (who have more Lego than I ever did by at least an order of magnitude) would shrug. They might express some passing interest, but it wouldn’t really matter to them. Unlike me. The Space Cruiser, set number 487 (that’s three digits, not four, to show how old it is) was the single most awesome set of Lego I ever had. While it’s true that I lusted after the bigger Galaxy Explorer (set number 497) that came out in 1979, I spent endless hours playing with the one I had. I was particularly fond of the opening back cargo area. Today, quite by accident, I learned that the original set retailed for about $10, and that one can find the set online from collector sites for a minimum of $150. I don’t often get attacks of nostalgia, but this totally hit me in the heart. I still have all the parts at my parents house. I wonder if I could rebuild it. I still have all the parts, including those pieces with the classic Spaceship-and-Moon logo and the lide pieces marked “LL 924”.